After a good night sleep in my Aria suite, it was time to live an M life Moment and swim with the dolphins at Siegfried & Roy’s Secret Garden and Dolphin Habitat at The Mirage. On a beautiful morning in Vegas, we got up close and personal with some of the world’s most beautiful, intelligent animals. M life gives members an exclusive experience swimming with bottlenose dolphins, a Moment I’ll never forget. You find this opportunity at other resorts, so get going and join M life https://www.mlife.com/ so you can experience some of these life-changing events. I heard of the Aureole restaurant in Mandalay Bay, and now through M life Moments, we were going to learn to cook in the style of famed celebrity chef Charlie Palmer. This exclusive package includes a private cooking lesson with Aureole Executive Chef Vincent Pouessel and a tour of Aureole’s famous Wine Tower, and we savored every moment. After watching Chef Pouessel make French onion soup, we all had a sample for ourselves and it was nothing short of incredible. Afterwards, we enjoyed a multi-course lunch with wine pairings with Chuck Bowling, President & COO of Mandalay Bay. Mr. Bowling was very welcoming and also reviewed many of the exciting projects underway at Mandalay Bay Resort. I’m going to keep an eye out for Mandalay Bay because they are in the process of totally transforming an already top-notch resort. We then had a roundtable with the bigs from MGM Resorts. This was our chance to have all of our M life questions answered. Our team of writers had the opportunity to sit down with two of MGM Resorts International’s top executives, Scott Voeller (Senior VP of Brand Strategy & Advertising) and Tom Mikulich (Senior VP of Business Development), for a special roundtable discussion. It was here that I learned exactly what MGM expects to provide M life members and that is “access.” The M life program provides MGM customers the chance to earn points that can be redeemed for access at all of the MGM Resorts. The M life is the ultimate way to earn rewards for virtually every dollar you spend. All you have to do is enjoy hotel, dining, entertainment and spa experiences, along with slots and table games, and you'll earn your way toward amazing rewards and benefits. Tier Credits is the engine that drives M life. Each Tier Credit you earn gets you closer to the next tier of membership. You earn credits through slots and video poker, table games, hotel accommodations, dining entertainment and spa. Another original M life Moment was an evening with Master Artist Jeff Mitchum at his gallery located in the Bellagio. If you could spend an evening with a world-renowned photographer, what would you ask? What would you hope to discover? This special M life Moment gives you the rare chance to hang out with fine-art photographer Jeff Mitchum in his own gallery. You will receive a private tour (lead by the artist) of his gallery, drink cocktails with Jeff at Hyde Bellagio, and receive a signed collector’s edition book of his work. We did all of that and Jeff’s work is not only astonishing, but he’s also a great guy. Along with Jeff, we then headed to Hyde Bellagio, where celebrities go to truly enjoy Las Vegas. M life members can party like a rock star at Hyde Bellagio, located on the 50-yard-line of Bellagio’s iconic lake. Like us, you can enjoy VIP treatment while sipping savory libations and marveling in tableside cocktail presentations. 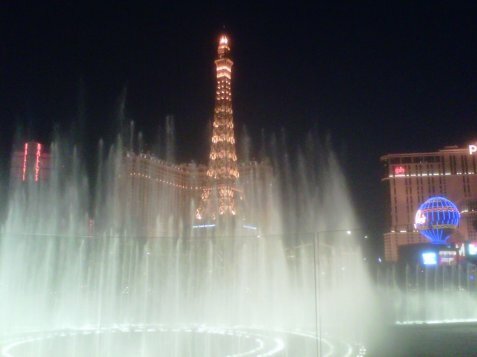 A few of our writers even had an opportunity to pick the songs for The Fountains of Bellagio, an exclusive M life Moment. This experience was one of the highlights of my trip as the views are breathtaking and Hyde is a very soothing place right by the Bellagio fountains. This is an M life Moment for the ages!! The M life just kept getting better as we boogied down to Sensi for dinner. It was at Sensi that we enjoyed a special dining experience courtesy of Sensi’s talented executive chef Roy Ellamar, who recently won an episode of Food Network’s hit television show “Chopped.” Chef Roy welcomed our group before we enjoyed the restaurant’s unique and indulgent dishes inspired by cuisines from all over the world. One can also choose to experience Chef Roy’s three-course meal, which he crafted and prepared to win “Chopped.” I had a filet for my entrée and it was beyond delicious! This late dinner was excellent and had us charged for what the next day of the M life had in the works. There are buffets out in Las Vegas, and then there is the Aria buffet. Live action stations line the newly redesigned Buffet at ARIA, offering freshly made specialties along with the only tandoor oven in a Las Vegas buffet serving baked naan and delicious kabobs. Before you leave Vegas, enjoy the new fresh fish market station and all-you-can-drink specials that include sangria, premium beer and wine. I can tell you we enjoyed just about every station at the Aria buffet. Before taking off to the Michael Jordan Celebrity Invitational at Shadow Creek, Aria reps gave us a tour of the Aria Sky Suites. A recent recipient of the Forbes Five-Star Award, we had an exclusive tour of the luxurious ARIA’s Sky Suites high above the Las Vegas Strip. A hotel-within-a-hotel, Sky Suites offers some of the most luxurious, tech-savvy accommodations in Sin City. If you recognize and appreciate sleek and modern like we do, then you’ll be impressed when in Aria Sky Suites. After approximately a 15-minute drive, we arrived at the Michael Jordan Celebrity Invitational at Shadow Creek and the course is picturesque. We watched A-list celebrities hit the green at Las Vegas’ most exclusive golf course. There was Marcus Allen, Brandi Chastain, Roger Clemens, Kevin Dillon, Julius Erving, Wayne Gretzky, Ken Griffey Jr., Mario Lemieux, Jerry Rice and many others in attendance. I enjoyed lunch and relaxed in the VIP Hospitality Deck overlooking the picturesque 18th hole. When returning to Aria, we stopped by the adults-only LIQUID Pool & Lounge at ARIA with VIP access. Liquid is basically a day club for those who want to start the party early. This place was rockin’ and the drinks were cold and the food was tasty. With M life access, you skip the line and enjoy the adults-only, outdoor playground LIQUID Pool & Lounge. Enjoy poolside pampering, hot DJs and daytime indulgence in this sizzling environment. Dinner was getting close and I was pumped that we were eating at AMERICAN FISH by Michael Mina at ARIA. Celebrating one of America’s great dining legacies is AMERICAN FISH, Michael Mina’s fifth restaurant in Las Vegas. Rustic cooking methods from across the country are celebrated and applied with modern finesse. Featuring classic cocktails with modern twists, AMERICAN FISH recently introduced a new menu and it was out of this world. AMERICAN FISH is now one of my favorite restaurants in Vegas! After a visit by some of the performers from “Zarkana by Cirque du Soleil” at Aria we went, to see their show. Cirque’s newest show to hit the Las Vegas strip, “Zarkana” is a visually stunning modern acrobatic spectacular set in a world where physical ability meets with the extraordinary. Surrender to a spellbinding extravaganza that defies the possible and will leave you breathless! Because we were living the M life, the party continued to HAZE Nightclub at Aria. We had bottle service and shared the club with Michael Jordan, Penny Hardaway, Bruce Smith and other celebrities. One can dance the night away at one of Las Vegas’ hottest nightclubs: HAZE. In true M life fashion, we enjoyed VIP entrance, bottle service and a private table with a great group of new friends. All of this is now available to Bullz-Eye readers by joining M life here and you’ll be on your way to earning points and choosing the M life moments that can change your Vegas experience forever!